Mohawk's acquisition of Crane Stationary includes all three premium Crane brands: Crane & Co., William Arthur and Vera Wang. April 6, 2018 - Mohawk Fine Papers, Inc., announced yesterday that it has purchased Crane Stationery Corporation of North Adams, Massachusetts for an undisclosed amount. This acquisition includes all three premium Crane brands: Crane & Co., William Arthur and Vera Wang. Founded in 1801, Crane has been synonymous with luxurious cotton papers and the finest personalized stationery in the world. “The Crane name and reputation has withstood the test of time for more than 200 years and we are very excited to add this legendary paper and stationery brand to our family portfolio,” said Tom O'Connor, Mohawk Chairman and CEO. 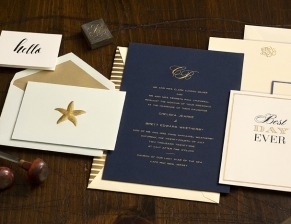 The combined companies will expand Mohawk's product offering to include Crane's extensive, iconic line of boxed stationery, wedding invitations, holiday cards and other personalized products, as well as Crane Crest, Crane Bond and Crane Lettra. Mohawk and Crane will maintain their respective existing brand names and continue to offer their unique portfolios and offerings, while at the same time expanding products, offerings and channels. Mohawk has assigned Paul Biesiadecki to oversee the Crane Business and facilitate the transition to Mohawk. Dean Daigle will be responsible for all Crane operations including Finance, HR, and IT, and Bart Robinson will lead the Sales and Marketing teams. All Crane employees with the exception of the three owners will join the Mohawk team. Mohawk is North America's largest privately-owned manufacturer of fine papers and envelopes for commercial and digital printing, photo specialties and high-end direct mail. To learn more, please visit: www.mohawkconnects.com. SOURCE: Mohawk Fine Papers, Inc.